A “virgin” version of this recipe without alcohol for kids or others who are avoiding alcohol appears below. This is a simple treat that is just perfect for the warmer months. Enjoy! Frozen Watermelon Mojito Pops - slices of watermelon soaked in a mojito cocktail mixture, then frozen. A simple grown up boozy summer popsicle! 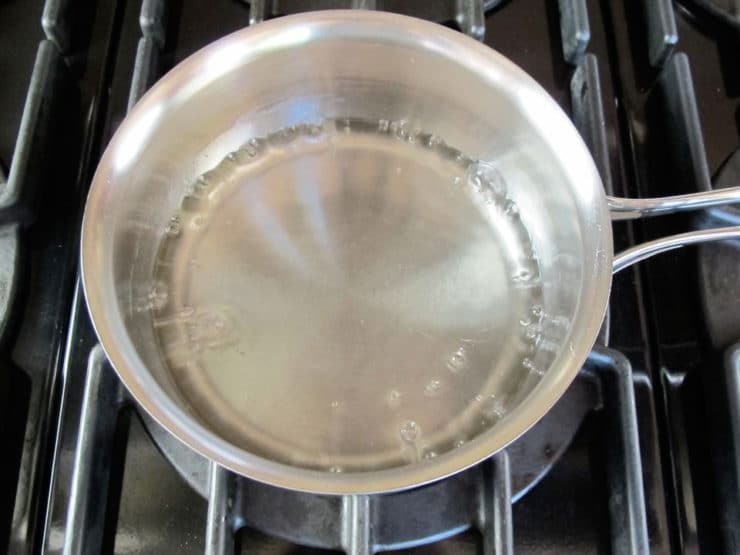 In a small saucepan, combine sugar and 3/4 cup of water. 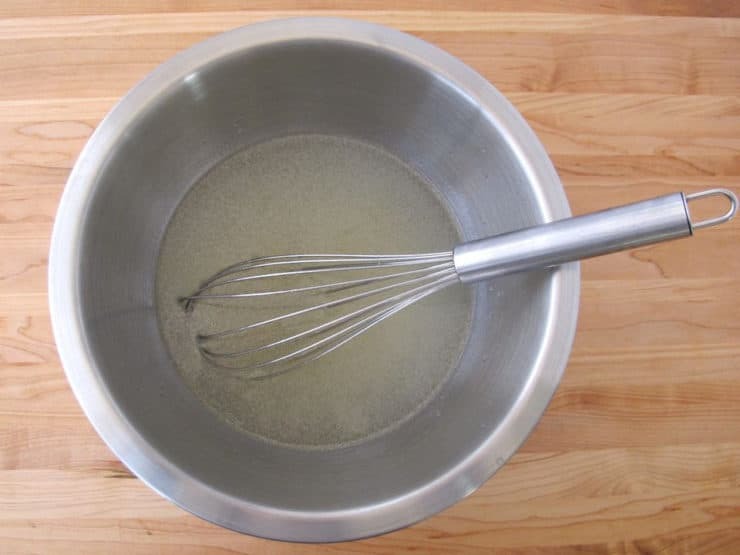 Bring to a boil, whisking constantly, till the sugar is dissolved (about 3 minutes). Remove from heat and allow to cool completely. This is your simple syrup. Note: if your watermelon is not very ripe/sweet or you prefer a sweeter pop, you can make your simple syrup with 1 cup of sugar and 1 cup of water. 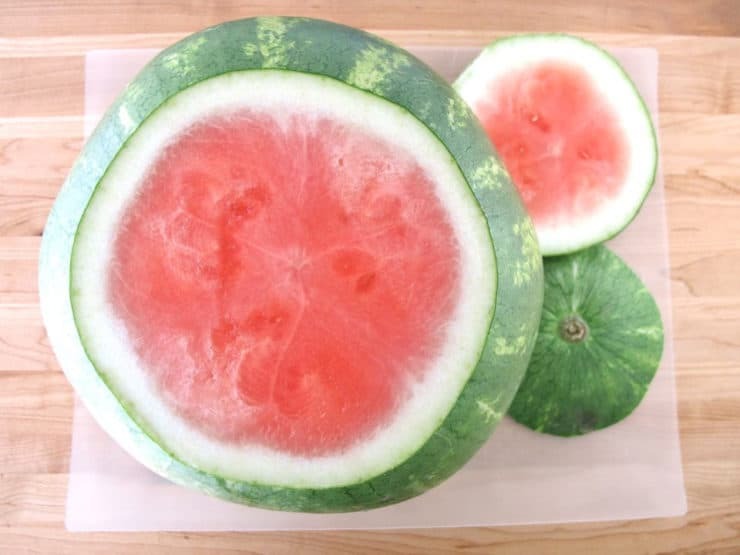 To create triangular watermelon slices, choose a small, ripe, seedless watermelon (10-15 lbs). 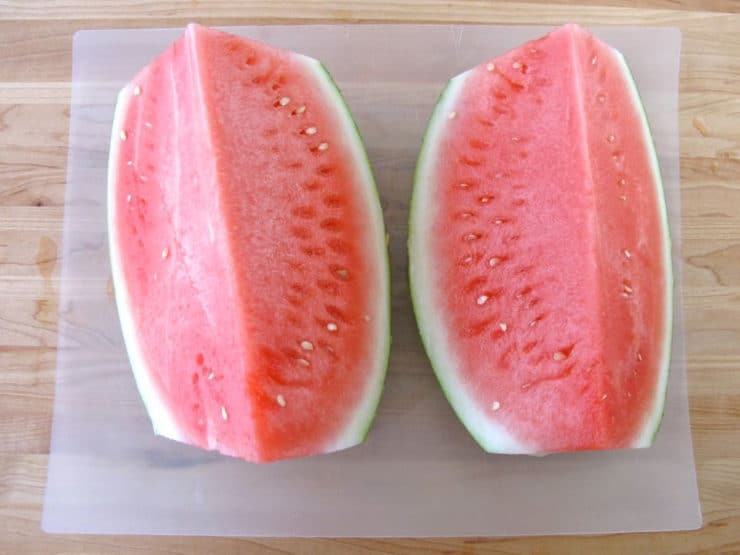 Cut the two tip ends off of the watermelon to flatten them. Stand the watermelon on one flat end so the other flat end is facing upward. 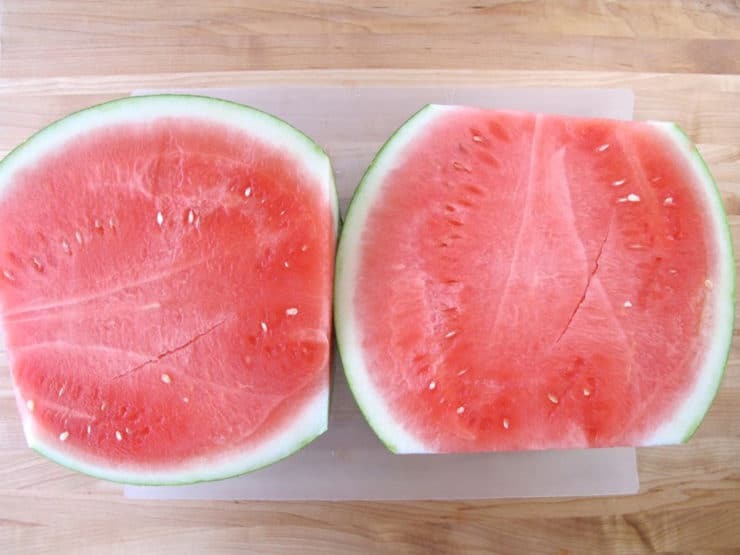 Slice the watermelon lengthwise to create two long halves of melon. 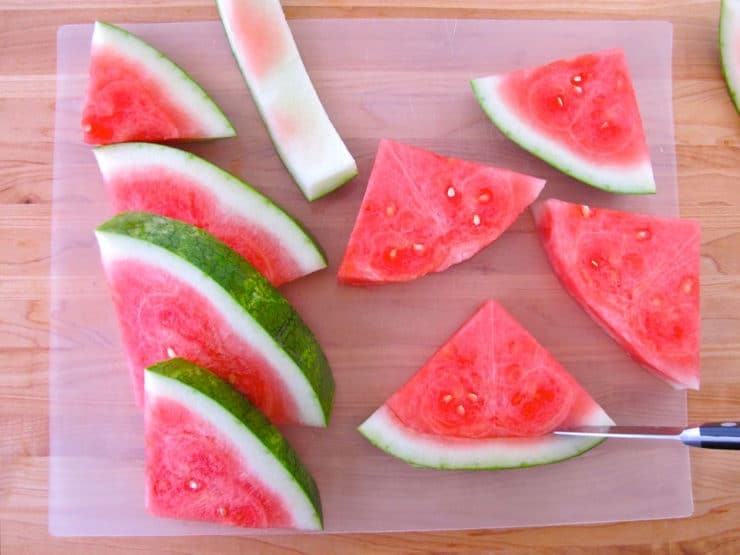 Slice each half lengthwise to create four equal quarters of melon. Take a quarter and slice it into triangles 1-inch thick. Use a small paring knife to cut the rind off of each triangle of melon. Weigh the slices till you have about 2 lbs of melon (about 10 triangles). Place the slices into a 9x13 dish in one layer. In a mixing bowl, whisk together the simple syrup, rum, lime juice, and mint extract. Pour the mojito mixture over the top of the watermelon slices. Let the fruit soak in the liquid at room temperature for 20 minutes. 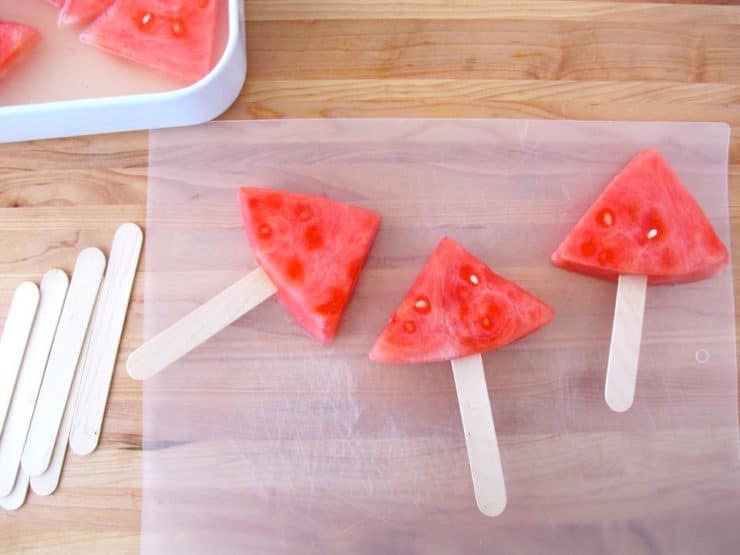 Take the melon slices out of the liquid and stick a wooden popsicle stick into the base of each one. I found my popsicle sticks at a local craft store. 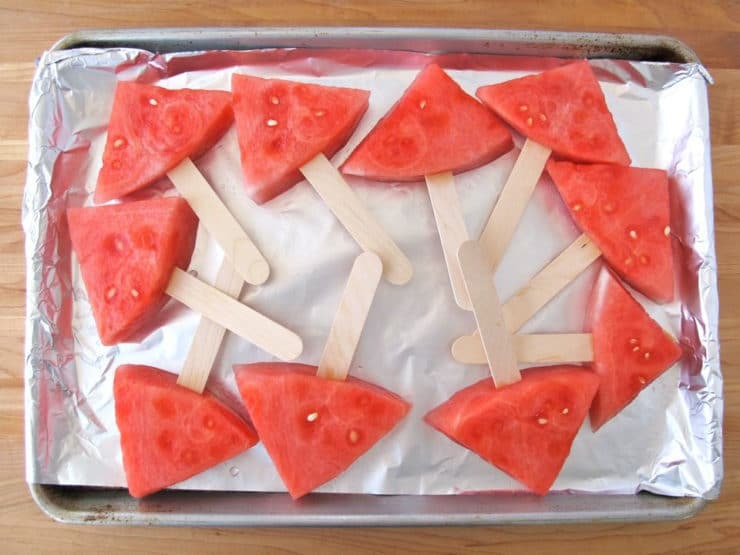 Place the watermelon pops onto a foil-lined baking sheet. 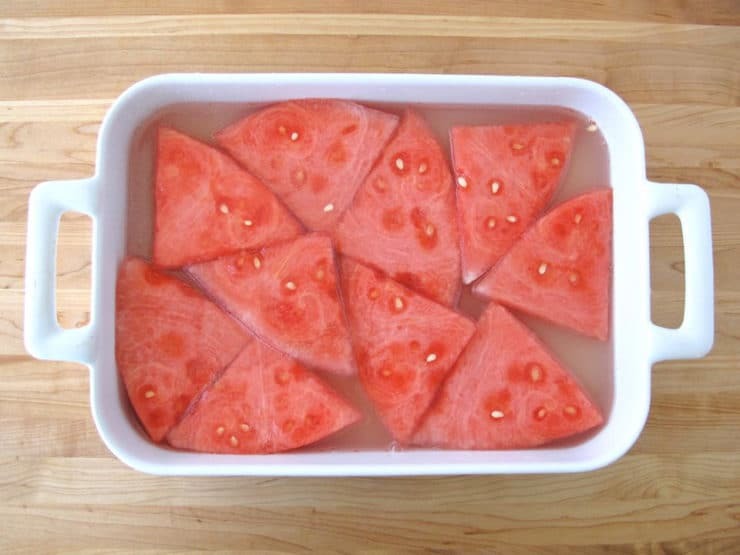 Freeze for at least 1 hour. Serve pops on a bed of crushed ice to keep them cold. I like to garnish the ice with fresh mint. 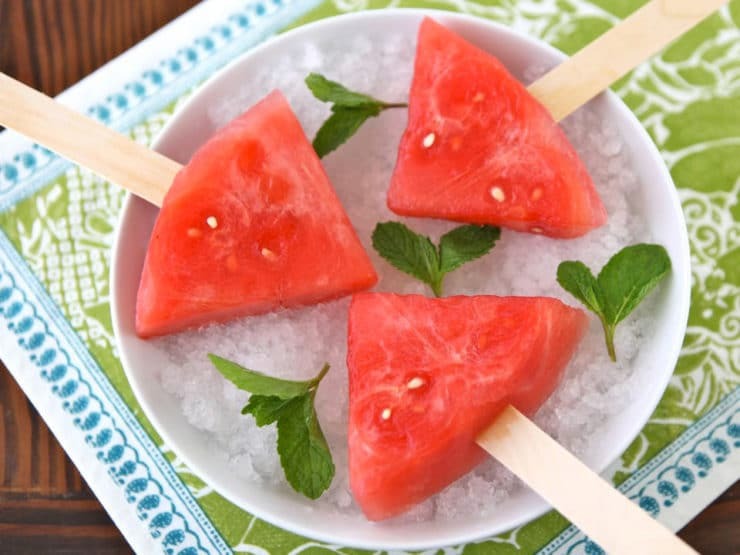 The easiest way to make these pops non-alcoholic is to soak the watermelon slices in some sort of juice rather than the alcohol mixture. I like white grape juice-- orange will work well, too. 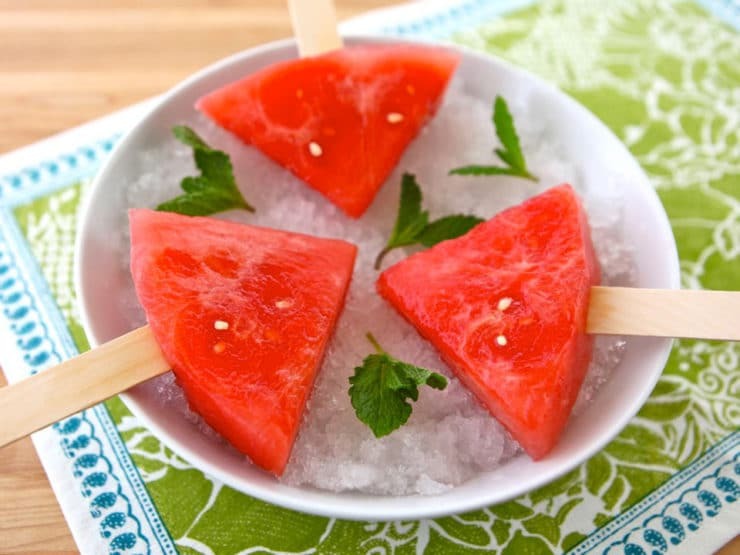 The watermelon loses some of its natural sweetness when it freezes, particularly if it's not quite ripe, so a sweet soaking liquid is important. If you'd like a more mojito-like flavor, instead of making the mojito mixture, whisk together 2 cups of Sprite or 7-Up, simple syrup (1/2 cup water and 1/2 cup sugar boiled for 3 minutes till sugar is dissolved, then cooled), 1/4 cup lime juice, and 3/4 tsp of mint extract. Taste the mixture before soaking the melon slices and adjust ingredients according to taste (more lime juice for tartness, mint extract for a pronounced mint flavor, etc.). If you're making these for kids, you may want to stick with the juice version-- the lime and mint adds a more grown-up flavor. 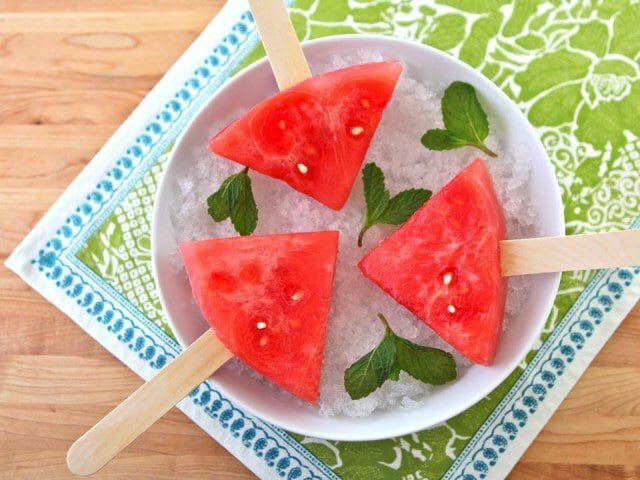 Soak the watermelon slices for 20 minutes in the soda mixture, then assemble and freeze the pops as directed above. I want to serve these during cocktail hour at my picnic style wedding in September. Do you think that if these were made & refrigerated up to 24 hours in advance they would still turn out alright? Hi Heather– I don’t recommend making them over an hour ahead, otherwise they freeze too hard and become difficult to eat. They’re really best when they’re frozen for only an hour. Just came across your fantastic blog and was searching through the recipes. Can’t wait for it to get warm enough to make some of these! Brilliant! I love something new to have at our summer parties by the pool. Quite lovely, really. Why on Earth has Cooking Network or Food Channel not gotten this lady on air? She is beautiful talented and I think she offers something in a way us everyday folk love.Lady you rock! Can’t wait to try this as a healthy, fun dessert for my kids. Also, love your food photography. Thanks for posting. I am soooo doing some of these. Hey, not bad bedtime snacks for those pesky little ones either. lol Not really but could cut some teething pain, ya think? rofl….. Nope, my selfish streak would kick in … give me that pop kid! I love eating frozen fruit. The mojito flavor is an equivalent to the cherry on top. What a great idea Tori! I really love these. I didn’t realize you could freeze watermelon. This is on my must make list! Thanks Diana! Yes, you can freeze watermelon, but you have to add something to it before you do– the fruit loses some sweetness and flavor when it is frozen, so soaking it in some sort of sweet liquid really improves the flavor. On its own it can be a little bland. these look right up my alley–can’t wait to try both variations! That is an amazing perfect Summer treat. Such fun! I love the idea of spiked frozen fruit. 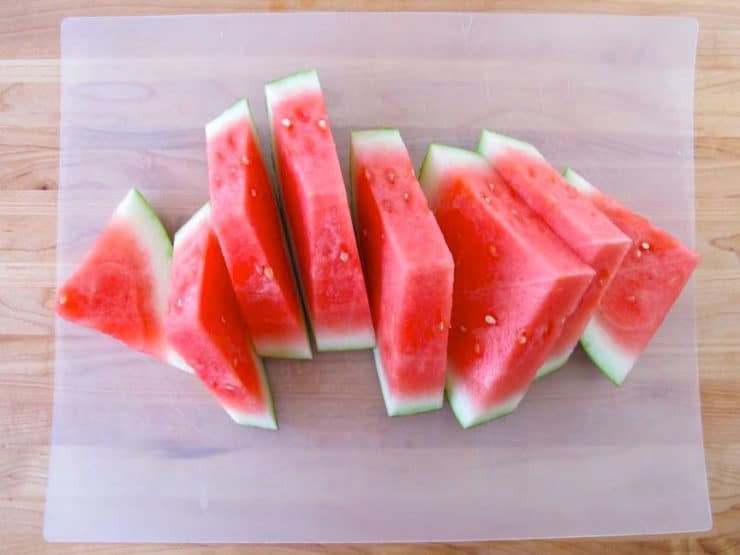 Great photos showing how-to slice the watermelon. These are so fun! Love this idea! Sounds so perfect for a warm day. I’m thinking you could sub basil for the mint…worth a try! Can diet 7-Up or diet Sprite be used? With 2 diabetics in the house, I try to steer away from high sugar items. Thanks! For sure! If your watermelon is not quite ripe, it might be lacking some sweetness, so add additional sweetener to the soaking liquid as needed. We are trying to cut back on sugar. . .Is the sugar necessary? Yes, because it cuts the taste of the alcohol– but if you’re comfortable using a sugar substitute (like stevia or Splenda), that would probably work just fine too.